The original charter was surrendered on 12/12/1821 (III-368); it was restored following a dispensation in December 1865, but the lodge's date of precedence is 1866, not 1797. R. W. Lemuel Newcomb, M.
W. Joseph Pierce, S. W.
W. Phillip Higgins, J. W.
by Rt. Wor. Henry A. Snow. The first pages of the records of the first Adams Lodge are missing and much information of value is lost. The building in which the meetings were held evidently was situated on the site of the present moving picture theatre. It was held by the "Proprietors of Masonic Hall and School Room" and in January 1798 consisted of 23 members, one member of which was named as school agent. The byJaws state that $10.75 be charged for the Entered Apprentice Degree, 25¢ for the Fellowcraft Degree, 25¢ for the Master Mason Degree, and $5.00 was assessed for membership. The by-laws also state that the Lodge consist of 40 members and no more. The records however show that there were a much larger number taken into membership. It was an early custom of this Lodge to lend money to its members taking a note for the same. This practice evidently was somewhat unhappy as the by-laws were early amended that in the future the notes of hand were to be signed by two responsible members. Visiting Brethren were assessed 25¢ each. Candidates were from the area Wellfleet to Barnstable. A lack of work was evidenced in 1805 and in 1806; the records note from time to time "a few members met". The Lodge up to June 1809 observed St. John's day every year by a service delivered by a Reverend Brother and followed by a dinner. This communication each year seems to be the outstanding one as recorded. In the list of Lodges under the authority of the Most Worshipful Grand Lodge of Mass., Adams Lodge ranked 37th in seniority and was located in the third district. From 1806 to 1813 the meetings were irregular and ceased to be recorded after 1813. December 12, 1821, Grand Lodge records, "Adams Lodge in the eleventh district has surrendered its charter." January 28, 1823, ten members of the former Lodge met and divided $49.63. At this point in the records of the Lodge rhe remaining pages of the record book have been cut out. The Lodge from time to time appointed a liquor agent. An excerpt from the records reads, "February 11, 1805, Brother Thomas Higgins Worshipful Master, should buy liquor at Boston, for the hall, viz, brandy, gin, WI rum, Gwine, 5 or 6 gallons of each, and draw the money out of the fund." It is noted that the records in several instances record the Lodge as voting that at banquets, the members will pay for the food, the Lodge paying for the liquors. July the ninth 1804, Brother Samuel Newcomb was voted $5.00 for his Past Master's jewel. Fuel was furnished the Lodge at a cost of $3.00 per year. The rent of the hall paid to the Proprietors of the hall averaged $25.00 per year. July 13th, 1801, it was voted that the Masons in Dennis and towns adjacent be recommended to the Grand Lodge to obtain a Charter for a Lodge to be held in Dennis. The records record no instances of disagreement among the members, unanimity and concord prevailed, the harmony of the meetings was unimpaired. Economic and political reasons seem to be the answer of the discontinuance of the Lodge. At the time of the application of the second Lodge for its Charter, the story exists that if a certain number of Brothers who were former members of the first Lodge could be located, the Charter of the first Lodge would be returned to Adams Lodge and the Lodge would function as never having been discontinued. All but one of the required number were located. After the new Charter had been issued one member was located at Portland, Maine, too late however to take advantage of the offer of Grand Lodge. What a lost opportunity! Today the Lodge would be nearly 145 years in existence instead of 75 years. The present Adams Lodge was the result of a meeting of Wellfeet members of the Craft for the purpose of establishing a Lodge of Master Masons in Wellfleet, Mass. At this meeting, held November 9, 1865, at the Center School House, it was decided to petition the Most Worshipful Grand Master of Massachusetts for a Dispensation to institute a Lodge of Master Masons in Wellfleet. A nominating committee, consisting of Albert W. Holbrook, Alonzo Hatch and Napthali Rich, presented a list of officers, namely, Napthali Rich, Worshipful Master, Harvey O. Sparrow, and George T. Wyer, Senior and Junior Wardens respectively. The list was accepted and on ballot they were declared elected. It was also voted to name the proposed Lodge, Adams Lodge, that being the name of the Lodge formerly established in Wellfleet. The Petition was presented to the Grand Master and a Dispensation was granted December 14, 1865 to form a Lodge at Wellfleet by Most Worshipful William Parkman. This Dispensation expired at the December communication of Grand Lodge, 1866. The first meeting of Adams was held January 8, 1866. Seven applications for degrees were presented. A committee was appointed to draft resolutions expressive of thanks to King Hiram's Lodge of Provincetown, for the gift of jewels and working tools. On December 10, 1866 the officers of Adams Lodge were instructed to apply for a Charter. Adams Lodge was constituted January 2, 1867, by Most Worshipful Charles C. Dame. The first visitation of Adams Lodge was on September 25, 1867. The records do not reveal the name of the Deputy, but state that he was accompanied by Bros. J. P. Johnson and Joseph Atwood of Provincetown, Mass. Adams Lodge held its meetings in Universalist Hall, which was rented from the Universalist Society, until March 7, 1877, at which time the hall on the second foor of the Wellfleet Savings Bank building was rented. The records do not show or allude to any building committee, yet on October 17, 1877, the Lodge held its first meeting in the present Masonic Hall. The hall was rented from the Trustees for $200.00 per year. On March 6, 1878, a square and compass to.ornament the tower of the hall was presented by Brother A. R. Critenden, of Middletown, Conn. The hall was erected by money secured from the sale of 300 shares of stock valued at $10.00 each. For several years in the nineties this stock paid dividends of 50¢ per share. The shares of the Hall stock have with the exception of about ten, either been purchased by the lodge or have been presented by the owners to Adams Lodge. The building is free of debt and is in fairly good condition except for a few new floor beams which the Trustees plan to renew at an early date. A comparison of expense of maintenance is interesting. A tax bill of 1902 shows the building taxes were $14.98. In 1939 the taxes were $142.00. Adams Lodge was quite prosperous in the fact that the first nine meetings recorded receipts of $1,385.00. Almost every meeting for the first seven years of its existence showed candidates were worked. In December the membership had increased from the 33 members who signed the Charter to 99. The first honorary member was Joseph Harding. Adams Lodge has had among its membership four D.D.G. Masters, R.W. Oliver H. Linnell 1893-1894, R.W. Everett I. Nye 1917-1918, R.W. Henrv A. Snow, 1932-1933, and R.W. Cyril W. Downs 1936-1937, a past Master of Universal Lodge of Orleans, Mass. On November 10, 1882 Adams Lodge was visited by Most Worshipful Samuel C. Lawrence. The purpose of the visit was to acquaint the members of Adams Lodge more fully regarding the "Capitation Tax." A fraternal visit was made by Most Worshipful Everett C. Benton, on Sunday June 29, 1913, at which time he presented the Lodge with a gavel made from cedar taken from the forest of Lebanon. The attendance of Lodge meetings has been very good. There are few instances of poorly attended communications. The last few years show a marked increase in attendance in spite of the fact that at present about 45% of the Lodge membership is non-resident. There are about 15 members of the craft residing in Wellfleet, whom we are pleased to receive at our Communications. These Brothers are members of Lodges in other districts. At the present time the Lodge membership is 90. Adams Lodge has three trust funds which are for the sole purpose of charity or relief. The Lodge Permanent Charity Fund was established January 16, 1915, by a vote setting aside $400.00 for that purpose. It was stipulated that the principal should be kept intact and only the interest used. This fund now amounts to $1,834.07 as additions to the principal have been made from time to time. The Anderson Fund became available on September 17, 1928, the amount of $500.00 having been bequeathed to the Lodge by Brother William A. Anderson. This fund was made subject to the same piovisions by vote of the Lodge as the Permanent Charity Fund and now amounts to $602.41. The Linnell Fund was established November 6, 1936. This was a bequest of R.W. Oliver H. Linnell to the amount of $1,000.00 This fund was made subject to the same provisions as the two other funds. The amount at present is $1,000.00. Adams Lodge has been able to take care of all calls made upon it for assistance and its records reveal that it was the custom to keep well informed of the needs of families of deceased brothers. On St. John's Sunday in the year of 1922, Adams Lodge together with the nine Lodges forming the then 32nd Masonic District attended divine service at the First Congregational Church at Wellfleet. Each Lodge attended as a unitl the service was under the direction of Rev. Brother Walter Yates, Chaplain of Adams Lodge, who addressed an unusually large number of the Brothers. Records unfortunately do not show the details of this outstanding service. Adams Lodge on March 19, 1921, received the degree team of the "Cable CIub", an organization of Masons connected with the N.Y., N.H. & H. R.R. This was the first of many visits to the Cape of this degree team. The candidate was Brother Theodore B. Williamson, a New Haven Railroad engineer who was raised to the sublime degree of Master Mason by the team. Recently the Lodge at a regular communication witnessed the unusual ceremony of a father raising his son and a son raising his father. The Worshipful Master, David M. Francis, raised his father, Brother Alexander A. Francis, and Wor. Bro. Raymond R. Freeman, Sr., raised his son, Bro. Raymond R. Freeman, Jr. In July 1938, the Lodge received the gift of land now being developed as a parking space from Brother Philip Scott. Donations of filling material and gifts of money have developed a parking space for about 15 cars. The Trustees plan further development in the near future. Effort is being made to secure photographs of former masters and members of the Lodge that the future may be able to identify individual members. A number of photos have been secured and hung in the Lodge room. The present membership is intensely interested in the Lodge upkeep, and donations of labor and material materially effect large saving to the Lodge Treasury. The oldest member of Adams Lodge is Brother Ebenezer Cole Paine, who on May 19, 1940, enters his 60th year of membership in the Lodge. Brother Paine resides in Salem, Mass., at 4 Linden St., and is in comparatively good health at the advanced age of 87. The oldest living Past Master, Worshipful Brother Arthur H. Rogers, is the third oldest member of Adams Lodge. The second oldest member is Brother Alvin L. Wiley, who in September of this year will complete 44 years of membership. Adams Lodge has ever been an important factor in the Town of Wellfleet, its members prominent in their various walks in life. It was considered a distinction to be able to attend public functions of the Lodge by the non-members of the fraternity. The members today are enjoying the fruits of the labors of the members who have passed to the Celestial Lodge above. They builded well. We the living members follow the Masonic example set by them that we may yield in due time to the following generation and present to them a record of Masonic achievement comparable to theirs. May the tenets of our Institution be transmitted through Adams Lodge pure and unimpaired from generation to generation. May brotherly love prevail and every Moral and Social Virtue cement us. By Right Worshipful Charles W. Huntley. Freemasonry started in Wellfleet as early as 1795, when a group of Brethren: Thomas Holbrook, Lewis Hamlin, Solomon Harding, Samuel Newcomb and Warren A. Kendrick, sold shares, in 1796, in a piece of property that they purchased from Joshua Atwood. "The last year past for a Schoolhouse lot." They built a house on said land, the "Lower part to be kept for the use of Schooling only; the upper part of said house to be kept for the use of Freemasonry only." This building was situated on "Reuben's Hill, so called" and stood on the site of the east end of the Congregational Church Parking Area where the Old High School stood and being next to Union Hall (or the old theatre building), both now razed. It was called Adams Hall. Forty shares were sold to the brethren from a stock company previously formed. The Hall was subsequently sold to the Universalist Society and long ago razed to the ground. On June 13, 1797 a dispensation was granted to establish a lodge which was called Adams Lodge. The first pages of the records are missing, so much information of value is not known. Why the "Adams" was selected, either for the hall or the Lodge, is purely speculation, as nothing to substantiate its reason has been found. In January 1798 the membership consisted of 23, one of whom was named school agent. The By-Laws stated that $10.75 be charged for the Entered Apprentice Degree, 25c for the Fellowcraft Degree, 25¢ for the Master Mason Degree; and $5.00 was assessed for membership. The By-Laws also state that the Lodge consist of 40 members and no more. However, the records show that there was a much larger number taken into membership. Candidates were from the area of Wellfleet to Barnstable. Lack of work was evidenced in 1805-1806 and the records note from time to time "a few members met." The Lodge, up to June 1809, observed Saint John's Day every year by a sermon delivered by a Reverend Brother, followed by a dinner. This communication seems to be the outstanding one of the year. In the list of Lodges, under the authority of the Most Worshipful Grand Lodge of Masons in Massachusetts, Adams Lodge ranked 37th in seniority and was located in the 3rd District. From 1806 to 1813 the meetings were irregular and ceased to be recorded after 1813. Grand Lodge Records, December 12, 1821, reads, "Adams Lodge in the 11th District has surrendered its Charter." On January 28, 1823 ten members of the Lodge met and divided #4-9.63 among themselves. They were: Thomas Higgins, Jeremiah Newcomb, John Newcomb, Eleazer Higgins, Joe Holbrook, Freeman Bacon, Sam Waterman, Beriah Higgins, Sam Rider and Nathaniel Young. The Lodge from time to time appointed a liquor agent. The records read, "February 11, 1805, Brother Thomas Higgins, Worshipful Master, should buy liquor at Boston for the hall, viz; brandy-gin-rum-wine- 5 or 6 gallons each, and draw the money out of the fund." It is noted that the records in several instances record the Lodge as voting that at banquets the members will pay for the food, the Lodge paying for the liquors. Other interesting bits from the records: July 9, 1804, "Brother Samuel Newcomb was voted $5.00 for his Pastmaster's Jewel"; January 12, 1801, "John Bacon took the Solemn Obligation of the Apprentice, Fellowcraft and Master Mason in Adams Lodge;" October 13, 1806, voted "M. Oliver Ford should have an order on the Treasurer of Adams Lodge for three dollars, it being for schooling Bro. Philip Higgins' son the year Bro. Higgins dies." It is of historical significance that the charter of this Lodge, dated June 3, 1797, was signed by Most Worshipful Paul Revere, Grand Master of Masons in Massachusetts; and that for June 13, 1797 to December 27, 1797, eight Brethren were made Master Masons. These eight must have received a diploma bearing his signature. In the American Lodge of Research, Page 20, Volume 5, December 18, 1947 to May 31, 1949, Paul Revere fashioned "a set of Jewels for Adams Lodge, Chartered 1797—Surrendered Charter 1821—the present Lodge being Chartered 1865." "In the Revolutionary War, Jeremiah Newcomb entered the service, March 1776, in Captain John Gills' Company of Well-fleet, sailed to Plymouth, then marched to Boston, where he was stationed with troops under General Putnam. Remained during the winter at Castle William helping build the fort, passed daily in flat bottom boat to Boston, and back, stashed and bedded those injured by the English, procured a mortar and stationed it on the North side of Long Island Head with breastwork and 6 Pounder cannon on Nantucket Hill to play across the head to the shipping of the enemy—the throwing of the third bomb caused the vessels to drop down near the lighthouse which they blew up. He was discharged at the end of 1777." He was taken prisoner November 28, 1780 and committed to Old Mill Prison, England, January 22, 1781. He received a pension under act of 1832. Jeremiah Newcomb was a prominent business man in Well-fleet and owned much of the town's land. He was a charter member of the first Adams Lodge and very active in many of its enterprises. He was "Proprietor of Adams Hall and the Schoolroom under the same." He was made a Mason in England but had since lost his Diploma. May 8, 1810, he was given a Diploma in place of the one he had lost so that he would have something to show that he was a Mason. This was a parchment made out and signed by the officers of the Lodge and implies that he was raised on that date, when in fact, he was a Charter member of the Lodge and one if its instigators." It is interesting to note that although this Lodge existed but a short time, there appeared much harmony among its members, that it was charitable to its members' widows and orphans, and that its interests in the schooling of the children of the community was of primary importance. The extending of "notes of Hand" to its members, plus the economic conditions of the times appear to be the answer to its discontinuance. The present Adams Lodge was conceived November 29, 1865, at a meeting of members of the fraternity held at the central school on Main Street where the present New England Telephone and Telegraph Company's Automatic Dial Building is located, at the intersection of Main, West Main, Briar Lane and Holbrook Avenue. At this meeting it was voted to name the Lodge Adams Lodge, that being the name of the Lodge formerly established in Wellfleet. The dispensation was granted December 14, 1865 by Most Worshipful William Parkman, who appointed Bro. Napthali Rich, Jr., Worshipful Master, Bro. Harvey 0. Sparrow, Senior Warden, and Bro. George T. Wyer, Junior Warden. The first meeting of Adams Lodge was held January 8, 1866, in Union Hall, sometimes referred to as Universalist Hall, located on a spot easterly in the parking area of the Congregational Church, later a moving picture theatre which has since been razed. At the first meeting the Lodge voted a committee to draft resolutions expressive of the thanks of Adams Lodge to King Hiram's Lodge in Provincetown for the gift of Jewels and working tools. On December 10, 1866 the officers of Adams Lodge were instructed to apply for a Charter. Adams Lodge was constituted January 2, 1867 by Most Worshipful Charles C. Dame. The first visitation of the District Deputy was on September 25, 1867. The records do not reveal the name of the Deputy, but state that he was accompanied by Bro. J. P. Johnson and Joseph Atwood of Provincetown, Mass. Adams Lodge held its meetings in Union Hall, rented from the Universalist Society until March 7, 1877 at which time they moved to the second floor of Bank Building on Bank Street. The building was the home of the Wellfleet Savings Bank and now known as Xavier Gonzalez's Art Studio. It was rented for $1.00 per week. On October 10, 1877, Adams Lodge held its first meeting in the present Masonic Hall, on the hill above the Town Pump, in the square of Commercial Street, Bank Street and East Commercial Street. On this Special Communication Bro. O. H. Linnell was raised a Master Mason. This hall was erected by money secured from the sale of 300 shares of stock valued at $10.00 each. For several years this stock paid dividends of $.50 a share. The shares of the hall stock were purchased and presented to Adams Lodge from time to time and on January 3, 1912, the Lodge voted to accept as a gift the Masonic Hall and other property of the Masonic Hall Association. Additions and improvements have been made from time to time but the building stands the same as it did when built. The Lodge owned property other than that they were occupying, for on April 13, 1868, after selling the carpet, curtains and other items, the Lodge voted to sell the "building" in South Wellfleet for $250.00, and on June 3, 1891 voted to sell to O. H. Linnell, land owned by the Lodge opposite Union Hall for $25.00. Adams Lodge was prosperous in the beginning, for the first nine meetings recorded receipts of $1,385. Almost every meeting for the first seven years of its existence showed candidates were worked. The Lodge membership has never exceeded that of 1959 when it had 133. The Records of Adams Lodge remind one of the loss of items of historical value, particularly those of the first Adams Lodge. On November 12, 1866, the Lodge "resolved that the thanks of this Lodge be tendered to Mrs. Kemp for a jewel presented to Adams Lodge, the same being a relic of the former Lodge of this town." On December 8, 1870 a vote of thanks was passed to King Hiram's Lodge for the invitation to the dedication of their Hall and for the many favors received from them. On November 10, 1882, M. W. Samuel C. Lawrence visited the Lodge to more fully acquaint the members of Adams Lodge regarding the "Capitation Tax." On June 29, 1913, M. W. Everett C. Benton paid a Fraternal Visit at which time he presented the Lodge with a gavel made from cedar taken from the Forest of Lebanon. On March 4, 1914, a motion was passed approving the action of the ladies in forming a Chapter of the Eastern Star. Twenty-two ladies and seventeen men were recorded as willing to join the Eastern Star. On September 6, 1916, Bro. O. H. Linnell presented Adams Lodge with a Rough and Perfect Ashler. On this same night Adams Lodge took favorable action regarding the new Lodge in Orleans, later known as Universal Lodge. On January 16, 1922, the Lodge was informed of the death of Bro. Melville W. Grant, its last Charter member, on January 12, 1922 in Newtonville. Two of our members, still living, attended the services: Wor. Zenas A. Howes and Wor. Wilbur H. Ryder. On Saint John's Sunday in 1922, Adams Lodge, together with nine Lodges forming the then 32nd Masonic District, attended Divine Services at the First Congregational Church at Wellfleet. The service was under the direction of Bro. Rev. Walter Yates, Chaplain of Adams Lodge. Three hundred fifty were present. On May 7, 1924, the Lodge voted to reimburse the Worshipful Master for sawing and splitting wood for Bro. Steve King. March 2, 1927, the Lodge held its first meeting with electric hghts. Some Brethren were asked to express their opinion regarding the new lights. May 4, 1927, the Lodge voted $25.00 for the Mississippi flood victims. On December 2, 1931, two collection plates were presented the Lodge by Lewis Higgins through Henry A. Snow in memory of Thomas E. Young. It was voted that these plates be used at every meeting and the money be turned over to the Master for charitable purposes. On March 2, 1932, it was voted that Congressman Gifford's gift of a picture of George Washington be displayed in the Lodge Room. On March 7, 1934, the Worshipful Master announced that Adams Lodge had won the membership contest held in the district for the year. Most Worshipful Curtis Chipman, Grand Master of Masons in Massachusetts, attended a dinner at Saint Martin's Lodge, in Chatham, prepared for the winners of the contest, on April 27, 1934. The Grand Master was so impressed with the attempt to stimulate larger attendance he made considerable note in his report to Grand Lodge at its next Quarterly Communication. (G.L. Proceedings, 1934, page 82). December 5, 1934, Wor. Manuel F. Corey presented the Lodge with a clock. January 6, 1937, on the 70th Anniversary the Lodge caused the Records of our first meeting to be read, January 9, 1867. Wor. Zenas A. Howes gave an interesting talk regarding the history of Adams Lodge. On May 4, 1938, the new Altar was dedicated as a Memorial to Wor. Charles F. Francis. February 1, 1939, Bro. Lester C. Taylor, Junior Deacon, discovered the records of the first Adams Lodge, 1797 to 1823. April 30, 1939, Wor. L. R. Gardinier, Master, and 40 Brethren attended a Special Communication commemorating the 150th Anniversary of the first inaugural of George Washington as President of the United States. This occasion was so outstanding the Brethren discussed it, at length, at the next meeting. On May 3, 1939, Wor. Harry E. Handy, Past Master of Charles C. Spellman Lodge, East Longmeadow, Mass., was introduced. In his remarks Wor. Bro. Handy invited Adams Lodge to exchange work during the year. This was favorably received and from then on fraternal visits have been paid to each other nearly every year. Fraternal friendships have grown and are still enjoyed by both Lodges. April 4, 1939, Austin L. Rose, Arthur Rose and William B. Rose presented a chair and placed it at the right of the Master's Chair. On April 30, 1940, Most Worshipful Joseph Earl Perry was made an Honorary Member. On May 1, 1940, a most unique event took place when Wor. David M. Francis, Presiding Master, raised his father, and the same evening Wor. Raymond Freeman raised his son, Raymond R. Freeman, Jr.
On May 11, 1940, Adams Lodge celebrated its 75th Anniversary. Most Worshipful Joseph Earl Perry, Grand Master, and his suite of 21 distinguished Masons were present. Wor. Bro. Doctor Clarence J. Bell was presented a Distinguished Service Medal. On January 6, 1943, the Honor Roll was called of those who had left to serve our country. Bro. Carl Benson was the only one present. Prayer was held and allegiance paid to the Flag and the National Anthem sung. On December 1, 1943, Wor. Austin Rose donated a chair for the use of the Junior Deacon. On October 12, 1946, Wor. Everett Priest of Charles C. Spellman Lodge presented the Lodge with Working Tools: a gavel and two truncheons. On May 3, 1950, the Cape Cod Past Masters Association was present to exemplify the third degree. Thirty-six Past Masters and both Deputies were present. On October 14, 1950, the Pratt & Whitney Masonic Degree Team paid the Lodge a visit and did the Third Degree in Connecticut form. Well over 100 were present. This was the start of a series of visits from this most famous group of Masons. February 3, 1954 was the first time the Lodge held a 'Fathers' and Sons' Night." On June 9, 1956, Adams Lodge played host to the Massachusetts Police Degree Team when they raised Bro. Frank Davenport, Chief of the Wellfleet Police Department. On April 27, 1957, Adams Lodge sponsored a District trip to our Masonic Home at Charlton. A large group of Brethren, as well as R.W. Charles W. Huntley, D. D. G. M., Provincetown 32nd Masonic District, were present. Three candidates received their first Degree. Gift boxes of candy and cookies were distributed among the guests of the Home. On November 24, 1958, the District Deputy Grand Master opened the first Lodge of Qualification to be held in our District. Each station was occupied by a past or presiding Master of the six constituent Lodges and three Masters-Elect were qualified. This custom has been repeated each year by succeeding Deputies. On November 15, 1958, the night of R. W. Charles W. Huntley's final Official Visitation as District Deputy, the Lodge received 75 on his official suite including twelve presiding Deputies. On May 12, 1959, the Lodge held a "Gus Howes Night" honoring our oldest living Past Master, Wor. Zenas A. Flowes, who served as Master in 1913 and 1914. Many of his friends from Chatham and Wellfleet were in attendance to honor our elder Brother. On September 13, 1958, Adams Lodge "voted to leave the Records of the first Adams Lodge (1797 to 1823) in the hands of the Grand Lodge" and so after 137 years the Records of this Lodge were finally placed in the custody of Grand Lodge. On June 14, 1960, Adams Lodge was honored with a visit by M. W. Thomas S. Roy, Past Grand Master, who occupied the East and raised the Congregational and Methodist Ministers of our town. Present were 11 of our 14 living Past Masters. On January 28, 1961, M. W. Laurence E. Eaton, Grand Master, and Grand Lodge Officers attended the Reception given in honor of R. W. Charles W. Huntley, Senior Grand Warden of the Most Worshipful Grand Lodge of Masons in Massachusetts. There were over 225 Brethren present. R.W. Bro. Huntley was presented the prized Henry Price Medal by the Grand Master. Wor. George E. Rose, Master of Adams Lodge and newly appointed Grand Pursuivant of the Grand Lodge, presided over the meeting held at the Wellfleet Elementary School Auditorium. On February 13, 1962, the Lodge was informed of the election of Bro. Howard C. Atwood to the office of Grand King of the Grand Chapter, Royal Arch Masons of Massachusetts. On March 14, 1962, M. W. Laurence E. Eaton was voted an Honorary Member of Adams Lodge. On March 26, 1963, Wor. Zenas A. Howes received a 50 Year Past Master's Diploma from R.W. Earle H. Foss, D. D. G. M. of the Provincetown 32nd Masonic District. During these 100 years of service to the Craft many honors have been received by Adams Lodge. R. W. Cyril W. Downs and R. W. Charles W. Huntley were elected Senior Grand Wardens of Grand Lodge. R. W. George E. Rose was appointed Grand Pursuivant. Five Brethren were elected Master of the 15th Lodge of Instruction: Henry A. Snow, Lester C. Taylor, Charles W. Huntley, George E. Rose, and our presiding Master, Warren F. Dyer. The Lodge has produced five District Deputy Grand Masters: Oliver H. Linnell, Everett I. Nye, Henry A. Snow, Charles W. Huntley and George E. Rose. The Lodge has received Blood Citations on two occasions and is continually working on this program. As we acknowledge our gratitude to all the Brethren who have worked for the welfare of Adams Lodge, we sincerely pray that our endeavors will be blessed by the Supreme Intelligence, that our future may develop stronger ties of love and friendship, that we may increase the lustre of our reputation, and enable us all to live more closely to the principles of this time-honored Institution. Freemasonry started in Wellfleet as early as 1795, when a group of Brethren; Thomas Holbrook, Lewis Hamlin, Solomon Harding, Samuel Newcomb and Warren A. Kendrick, sold shares, in 1796, in a piece of property that they purchased from Joshua Atwood, "The last year past for a Schoolhouse lot." They built a house on said land, the "Lower part to be kept for the use of Schooling only; the upper part of said house to be kept for the use of Freemasonry only." This building was situated on "Rueben's Hill, so called" and stood on the site of the east end of the Congregational Church Parking Area where the Old High School stood and being next to Union Hall (or the old theatre building), both now razed. It was called Adams Hall. Forty shares were sold to the brethren from a stock company previously formed. The Hall was subsequently sold to the Universalist Society and long ago razed to the ground. On June 13, 1797 a dispensation was granted to establish a lodge which was called Adams Lodge. The first pages of the records are missing, so much information of value is not known. Why the "Adams was selected, either for the hall or the Lodge, is purely speculation, as nothing to substantiate its reason has been found. In January 1796 the membership consisted of 23, one of which was named school agent. The by-laws stated that $10.75 be charged for the Entered Apprentice Degree, 25¢ for the Fellowcraft Degree, 25¢ for the Mason Degree and $5.00 was assessed for membership. The by-laws also state that the Lodge consist of 40 members and no more. However, the records show that there was a much larger number taken into membership. In the list of Lodges under the authority of the Most Worshipful Grand Lodge of Masons of Massachusetts, Adams Lodge ranked 370 in seniority and was located in the 3rd District. From 1806 to 1813 the meetings were irregular and ceased to be recorded after 1813. Grand Lodge Records, December 12, 1821, reads, "Adams Lodge in the 11th District has surrendered its Charter." On January 28, 1823 ten members of the Lodge met and divided $49.63 among themselves. They were: Thomas Higgins, Jeramiah Newcomb, John Newcomb, Eleazer Higgins, Joe Holbrook, Freeman Bacon, Sam Waterman, Beriah Higgens, Sam Rider and Nathaniel Young. The Lodge from time to time appointed a liquor agent. The record reads, "February 11, 1805, Brother Thomas Higgens, Worshipful Master, should buy liquor at Boston for the hall, viz. ; brandy-gin-rum-wine-5 or 6 gallons each, and draw the money out of the fund." It is noted that the records in several instances record the Lodge as voting that at banquets the members will pay for the food, the Lodge paying for the liquors. Other interesting bits from the records; July 9, 1804, "Brother Samuel Newcomb was voted $5.00 for his Pastmaster's Jewel"; January 12, 1801, "John Bacon took the Solemn Obligation of the Apprentice, Fellowcraft and Master Mason in Adams Lodge." October 13, 1806 voted "M. Oliver Ford should have an order on the Treasurer of Adams Lodge for three dollars, it being for schooling Bro. Philip Higgins' son the year Bro. Higgins dies." It is of historical significance that the charter of this Lodge, dating June 13, 1797, was signed by Most Worshipful Paul Revere, Grand Master of Masons of Massachusetts; and that for June 13, 1797 to December 27, 1797, eight Brethren were made Master Masons. These eight received a diploma bearing his signature. In the American lodge of Research, Page 20, Volume 5, December 18, 1947 to May 31, 1949, Paul Revere fashioned "a set of Jewels for Adams Lodge, Chartered 1797 - Surrendered Charter 1821 - the present Lodge being Chartered 1865." "In the Revolutionary War, Jeremiah Newcomb entered the service, March 1776, in Captain John Gills' Company of Wellfleet, sailed to Plymouth, then marched to Boston, where he was stationed with troops under General Putnam. Remained during the winter at Castle William helping build the fort, passed daily in flat bottom boat to Boston, and back, stashed and bedded those injured by the English, procured a mortar and stationed it on the North side of Long Island Head with breastwork and 6 Pounder cannon on Nantucket Hill to play across the head to the shipping of the enemy - the throwing of the third bomb caused the vessels to drop down near the lighthouse which they blew up. He was discharged at the end of 1777." He was taken prisoner November 28, 1780 and committed to Old Mill Prison, England, January 23,1781. He received a pension under act of 1832. Jeramiah Newcomb was a prominent business man in Wellfleet and owned much of the town's land. He was a charter member of the first Adams Lodge and very active in many of its enterprises. He was "Proprietor of Adams Hall and the Schoolroom under the same. He was made a Mason in England but had since lost his Diploma. May 8, 1876, he was given a Diploma in place of the one he had lost so that he would have something to show that he was a Mason. This was a parchment made and signed by the officers of the Lodge and implies that he was raised on that date, when in fact, he was a Charter member of the Lodge and one of its instigators." It is interesting to note that although this Lodge existed but a short time, there appeared much harmony among its members, that it was charitable to its members' widows and orphans, and that its interests in the schooling of the children of the community was of primary importance. The extending of "notes of Hand" to its members, plus the economic conditions of the times appear to be the answer to lodge requesting Grand Lodge to hold its charter for a time. The present Adams Lodge was reformed November 29, 1865, at a meeting of members of the fraternity, held at the central school, on Main Street where the present New England Telephone and Telegraph Company's Automatic Dial Building is located, at the intersection of Main, West Main, Briar Lane and Holbrook Avenue. At the meeting, it was voted to request of Grand Lodge the return of the original charter. Shortly after, a fire occurred and the charter was destroyed. The Grand Lodge then permitted Adams Lodge to hold its original name. The formal reinstitution was completed and the charter that is now held by Adams lodge was issued. It was instituted December 14, 1865 by Most Worshipful William Parkman, who appointed Bro. Napthali Rich, Jr., Worshipful Master, Bro. Harvey O. Sparrow, Senior Warden and Bro. George T. Wyer, Jr., Warden. The first meeting of Adams Lodge was held January 8, 1866, in Union Hall, sometimes referred to as Universalist Hall, located on a spot easterly in the parking area of the Congregational Church later a moving picture theatre which having since been razed. At the first meeting the Lodge voted a committee to draft resolutions expressive of the thanks of Adams Lodge to King Hiram's Lodge in Provincetown for the gift of Jewels and working tools. On December 10,1866 the officers of Adams Lodge were instructed to apply for a charter. Adams Lodge was constituted January 2, 1867 by Most Worshipful Charles C. Dame. The first visitation of the District Deputy was on September 25, 1867. The records do not reveal the name of the Deputy, but state that he was accompanied by Bro. J. R. Johnson and Joseph Atwood of Provincetown, Mass. Adams Lodge held its meeting in Union Hall, rented from the Universalist Society until March 7, 1877 at which time they moved to the second floor of Bank Building on Bank Street. The building was the home of the Wellfleet Savings Bank and now known as Xavier Gonzalez's Art Studio. It was rented for S1.00 per week. The Records of Adams Lodge remind one of the loss of items of historical value, particularly those of the first Adams Lodge. On November 12, 1866, the Lodge "resolved that the thanks of this Lodge be tendered to Mrs. Kemp for a jewel presented to Adams Lodge, the same being a relic of the former Lodge of this town." On December 8,1870 a vote of thanks was passed to King Hiram's Lodge for the invitation to the dedication of their Hall and for the many favors received from them. On November 10, 1882, M. W. Samuel C. Lawrence visited the Lodge to more fully acquaint the members of Adams Lodge regarding the "Capitation Tax." On June 29, 1913, M. W. Everett H. Benton paid a Fraternal Visit, at which time he presented the Lodge with a gavel made from cedar taken from the Forest of Lebanon. On March 4,1914, a motion was passed approving the action of the ladies in forming a chapter of the Eastern Star. Twenty-two ladies and seventeen men were recorded as willing to join the Eastern Star. On September 6, 1916, Bro. O.H. Linnell presented Adams Lodge with a Rough and Perfect Ashier. On this same night Adams Lodge took favorable action regarding the new Lodge in Orleans, later known as Universal Lodge. On January 16, 1922, the Lodge was informed of the death of Bro. Melville W. Grant, its last Charter member on January 12, 1922 in Newtonville. Two of our members, still living, attended the services - Wor. Zenas A. Howes and Wor. Wilbur H. Ryder. On Saint John's Sunday in 1922, Adams Lodge, together with nine Lodges forming the then 32nd Masonic District, attended Divine Services at the First Congregational Church at Wellfleet. The service was under the direction of Rev. Bro. Walter Yates, Chaplain of Adams Lodge. Three Hundred fifty were present. On May 7, 1924, the Lodge voted to reimburse the Worshipful Master for sawing and splitting wood for Bro. Steve King. March 2,1927, the Lodge held its first meeting with electric lights. Some brethren were asked to express their opinion regarding the new lights. May 4, 1927, Lodge voted $25.00 for the Mississippi flood victims. March 2, 1932, it was voted that Congressman Gifford's gift of a picture of George Washington be displayed in the Lodge Room. On March 7, 1934, the Worshipful Master announced that Adams Lodge had won the membership contest held in the district for the year. Most worshipful Curtis Chipman, Grand Master of Masons of Massachusetts, attended a dinner at Saint Martin's Lodge, in Chatham, prepared for the winners of the contest, on April 27,1934. The Grand Master was so impressed with the attempt to stimulate larger attendance he made considerable note in his report to Grand Lodge at its next Quarterly Communication. (G.L. Proceedings, 1934, page 82). January 6, 1937, on the 70th Anniversary the Lodge caused the Records of our first meeting to be read, January 9,1867. Wor. Zenas A. Howes gave an interesting talk regarding the history of Adams Lodge. April 30, 1939, Wor. L.R. Gardinier, Master, and 40 Brethren attended a Special Communication commemorating the 150th Anniversary of the first inaugural of George Washington as President of the United States. This occasion was so outstanding the brethren discussed it, at length, at the next meeting. On May 3, 1939, Wor. Harry E. Handy, Past Master of Charles C. Spellman Lodge, East Longmeadow, Mass. was introduced. In remarks Wor. Handy invited Adams Lodge to exchange work during the year. This was favorably received and from then on fraternal visits have been paid to each other nearly every year. Fraternal friendships have grown and are still enjoyed by both Lodges. April 4, 1939, Austin L. Rose, Arthur Rose and William B. Rose presented a chair and placed it at the right of the Master's chair. On April 30, 1940, M. W. Joseph E. Perry was made an Honorary Member. On May 1, 1940, a most unique event took place when Wor. David M. Francis, Presiding Master, raised his father and the same evening Wor. Raymond Freeman raised his son, Raymond R. Freeman, Jr.
October 12, 1946, Wor. Everett Priest of Charles C. Spellman Lodge presented the Lodge with Working Tools - a gavel and two truncheons. On May 3, 1950, the Cape Cod Past Masters Association present to exemplify the third degree. Thirty-six Past Masters and both Deputies were present. On October 14, 1950, the Pratt & Whitney Masonic Degree Team paid the lodge a visit and did the 3rd Degree in Connecticut Form. Well over 100 were present. This was the start of a series of visits from this most famous group of Masons. February 3, 1954 was the first time the Lodge held a "Fathers and Sons' Night." On April 27,1957, Adams Lodge sponsored a District trip to our Masonic Home at Charlton. A large group of Brethren, as well as R. W. Charles W. Huntley, D. D. G. M., Provincetown 32nd Masonic District, were present. Three candidates received their first Degree. Gift boxes of candy and cookies were distributed among the guests of the Home. On November 15, 1958, the night of R.W. Charles W. Huntley's final Official Visitation as District Deputy, the Lodge received 75 on his official suite including twelve presiding Deputies. On May 12, 1959, the Lodge held a "Gus Howes Night" honoring our oldest living Past Master, Wor. Zenas A. Howes, who served as Master in 1913 and 1914. Many of his friends from Chatham and Wellfleet were in attendance to honor our elder Brother. On September 13, 1958, Adams Lodge "voted to leave the Records of the first Adams Lodge (1797 to 1823) in the hands of the Grand Lodge" and so after 137 years the Records of this Lodge were finally placed in the custody of the Grand Lodge. On January 28,1961, M. W. Lawrence E. Eaton, Grand Master, and Grand Lodge officers attended the Reception given in honor of R. W. Charles W. Huntley, Senior Grand Warden of the Most Worshipful Grand Lodge of Masons of Massachusetts. There were over 225 Brethren present. R. W. Huntley was presented the prized Henry Price Medal by the Grand Master. Wor. George E. Rose, Master of Adams Lodge and newly appointed Grand Pursuivant of the Grand Lodge presided over the meeting held at the Wellfleet Elementary School Auditorium. On March 14, 1962, M. W. Lawrence E. Eaton was voted an Honorary Member of Adams Lodge. On March 26, 1963, Wor Zenas A. Howes received a 50 Year Past Master's Diploma from R.W. Earle H. Foss, D.D.G.M. of the Provincetown 32nd Masonic District. Wor. John F. Doepper in March 1964 suggested that the Square & Compass Club be resurrected to raise funds to support the maintenance of the Hall. Sufficient funds to properly maintain it had not existed for many years. On April 20, 1965, the 100th Anniversary of Adams Lodge was celebrated. Wor. Warren F. Dyer was Master at that time. Most Worshipful A. Neil Osgood, Grand Master, presided. He was accompanied by a suite of 24 Grand Lodge Officers and Permanent Members of Grand Lodge. The Brethren adjourned to the Congregational Church for supper, followed by Centennial Ceremonies in the sanctuary. The Grand Master presided. In June of 1965, $5,000 was transferred to an IDS Mutual Fund wit only the income to be used for charitable purposes. It is recorded as The Permanent Charity Fund of Adams Lodge. At August 31, 1991, this investment had grown to $20,143. On September 10, 1973, $2,250 was voted to fix all windows and paint the building. A $1,000 gift from Mrs. Rogers, and fundraising activities of the Square and Compass Club, made this possible. On November 16, 1974, Adams Lodge received a Grand Lodge Certificate of Commendation for contributing $3,330 to the Masonic Home Expansion Fund. The Lodge had exceeded its quota of $2,500. In 1975, dues were raised from $10 to $17, where they remain. In 1982, two bequests totaling $2,000 were received (names not noted in the minutes). From 1982 through 1984, $11,200 was received from the John Stanley Morris Estate. This gift enabled the Lodge to undertake much needed work throughout the Hall. On April 10, 1987, Brethren from the Provincetown Masonic District paid Adams Lodge a fraternal visit to participate in the raising of Bro. Frederick H. Schulenburg. R. W. David Schofield, District Deputy Grand Master was received. In April of 1988, the Wellfleet Public Library produced a video tape on the history of Adams Lodge. R. W. Charles W. Huntley and R. W. Frederick F. Cue participated as narrator and interviewer, respectively. On June 14, 1988, Joseph Warren Royal Arch Chapter donated $5,000 to Adams Lodge. As part of Adams Lodge Awareness Program, the Lodge began participating in the annual "Wellfleet By Gone Days" celebration by having the Lodge Hall open to the public. In 1991, A Masonic Sign with directions to Adams Lodge was installed along Route 6. On May 8,1990, Adams Lodge paid honor to its Senior Past Master Wor. David M. Francis. M. W. Albert T. Ames presented Wor. David M. Francis his year Past Masters Certificate. Ninety-one attended the dinner in his honor at the Wellfleet United Methodist Church. Bro. Frederick H. Schulenburg was chairperson of this event. On December 11, 1990. Wor. Frederick H. Schulenburg invited the wives of the Brethren for dinner. While the regular Lodge communication was in session, the ladies prepared Christmas packages for our shut-in Brethren and Widows. All packages were delivered personally by Wor. Frederick H. Schulenburg. On Sunday, December 9, 1990, Adams Lodge began the first of its Masonic Sunday Services. Each have been well attended by the Officers and Brethren. In January 1991, Wor. Frederick H. Schulenburg requested of the Lodge, and by a favorable vote established, a scholarship of $250 for a worthy Nauset Regional High School graduate having Masonic ties. The Lodge also established a Memorial Fund and Memorial Book with the monies received to be used for Lodge property needs. Memorials may be in memory or to honor a living person. The first memorial received was from the Schulenburg family in memory of a family member who was a 32nd degree Mason. This gift paid for the sign erected in front of the Hall. In the spring of 1991, the Lodge voted to approve funds to repair and paint both the interior and exterior of the Hall. All bills have been paid from the Building and Memorial Funds. In addition, Brethren of the Lodge donated their time and monies for its completion. On Saturday, October 12, 1991, a Memorial Service was held in the Temple. Wor. Frederick H. Schulenburg officiated with Rev. Bro. Kenneth Roscoe as Chaplain. This service was requested by the Widow and family of our Past Master, Wor. John F. Doepper. There were eighty-six in attendance. A dinner followed the Service in the dining hall. In October, 1991 the Lodge celebrated the 125th Anniversary of the rechartering of Adams Lodge. M. W. Edgar W. Darling and a distinguished suite of masons, including M. W. Whitfield Johnson and M. W. Albert T. Ames, Past Grand Masters. The history was read by R. W. Frederick Cue and Wor. Frederick H. Schulenburg presented, on behalf of his family, a Paul Revere Bowl which is now in the archives of Grand Lodge. A donation to the Masonic Home was also presented. Wor. Frederick H. Schulenburg was appointed Grand Steward in December 1991. The Lodge continued Masonic Awareness programs in 1992. Wor. Frederick H. Schulenburg began the weekly Italian dinners, which benefits the Building Fund. The Lodge also began the annual Thanksgiving Dinner, which is free to the public. The Lodge continues the scholarship program and holds blood drives. 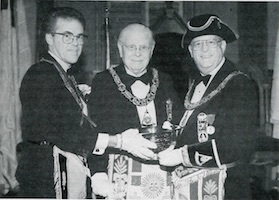 The Lodge was presented the Grand Masters Award several times during this period. December, 1992, Wor. Frederick H. Schulenburg was installed District Deputy Grand Master for the Provincetown 32nd Masonic District, a reception was held in February 1993. The Lodge experienced a stable growth during the 90's and we all hope it will continue. This growth can only be attributed to the favorable attention given the property of the Lodge; participation in local parades; and other Masonic Awareness programs. The Lodge was saddened to learn of the sudden death of R. W. Charles Huntley in November 1992. R. W. Frederick H. Schulenburg conducted a Masonic funeral with a large number of Brethren in attendance. During 1992, R. W. Frederick H. Schulenburg sold windows to friends of the Lodge. A memorial plaque was placed at each window. The funds received were used to help defray the building improvement cost. The lodge celebrated the 100th birthday of its oldest Past Master, Wor. Raymond Dyer on June 13, 1996. Wor. Raymond Dyer had as guest his children, grandchildren and great grandchildren as well as many other relatives. A letter of congratulations from our Grand Master, M. W. Arthur E. Johnson was read and our District Deputy Grand Master, R.W. E. Erik Erikson gave words of congratulations. R.W. Frederick H. Schulenburg declared the year the Raymond E. Dyer Year in honor of this worthy brother. In October 1996 Wor. Raymond Dyer was presented the Joseph Warren Medal from the Grand Lodge. His son Wor. Warren Dyer was present for both celebrations. Wor. Raymond Dyer had moved to the Pleasant Bay Nursing care facility. At the December Quarterly 1996, R.W. Frederick Henry Schulenburg was elected Junior Grand Warden of Masons in Massachusetts. On April 12, 1997, a reception was held in Grand Lodge Boston to honor R. W. Frederick H. Schulenburg. Most Worshipful Arthur E. Johnson, Grand Master, and Grand Lodge Officers attended. The Grand Master presented R. W. Frederick H. Schulenburg the Henry Price Medal. R.W. E. Erik Ericson, Senior Warden of Adams Lodge was appointed Grand Pursuivant. The reception was hosted by both Adams Lodge and Winslow Lewis Lodge. Wor. John F. Sugden Master of Winslow Lewis Lodge presided over the meeting. Our Masonic weekends have been a great joy for our Brethren, families and visitors of the Lodge. Our Widows are honored, our Brethren of Rhode Island and Wilbraham are honored here in Wellfleet. R. W. Charles Huntley began this program and R.W. Frederick H. Schulenburg resumed this event in 1992. Adams Lodge travels to both Rhode Island and Newton Lodge as well. During these 200 years of service to the craft, many honors have been received by Adams Lodge. R.W. Cyril W. Downs and R.W. Charles W. Huntley were elected Senior Grand Wardens of Grand Lodge; R. W. George E. Rose was appointed Grand Pursuivant and elected Junior Grand Warden; R. W. Frederick H. Schulenburg was appointed Grand Steward and elected Junior Grand Warden; R.W. E. Erik Erikson was appointed Grand Pursuivant. Seven Brethren were elected Master of the 15th Lodge of Instruction: Henry A. Snow, Lester C. Taylor, Charles W. Huntley, George E. Rose, Warren F. Dyer, Joseph F. Prose, and Frederick H. Schulenburg. The Lodge has produced eight District Deputy Grand Masters: Oliver H. Lennell, Everett 1. Nye, Henry A. Snow, Charles W. Huntley, George E. Rose, Joseph F. Prose, Frederick H. Schulenburg, and E. Erik Erikson. The Lodge has received Blood Citations, Grand Master Fair Recognitions, Grand Masters Awards, and continues to work on its Awareness Program. As we acknowledge our gratitude to all the Brethren who have worked for the welfare of Adams Lodge, we sincerely pray that our endeavors will be blessed by the Supreme Intelligence, that our future may develop stronger ties of love and friendship, that we may increase the luster of our reputation and enable us all to live more closely to the principles of this time honored institution. R. W. Frederick Henry Schulenburg, Lodge Historian. Having worked the required year under Dispensation, this active and promising Lodge was constituted, and its officers were publicly installed by the M.W. Grand Lodge on the evening of Jan. 3, last. The ceremonies of installation took place in one of the churches of the village, and in the presence of one of the largest and most attentive audiences we have recently met. At the conclusion of the ceremonies, the Rev. Br. Dadmun, one of the Grand Chaplains, gave an appropriate and excellent address, which was well received. Adams Lodge was originally chartered by Paul Revere in 1797. On Saturday, October 19, 1991. Adams Lodge celebrated its 125th Anniversary of the organization of the Lodge. Participating in the event were M.W. Edgar W. Darling, Grand Master, and a suite of Grand Lodge Officers including R. W. Richard J. Stewart, Deputy Grand Master; R. W. Charles D. Batchelder, Jr., Senior Grand Warden; R. W. Warren R. Davis, Junior Grand Warden; M. W. Whitfield W. Johnson, Esq., Past Grand Master: M. W. Albert T. Ames, Past Grand Master; R. W. Charles W. Huntley, Past Senior Grand Warden; R. W. Stafford E. Davis, Past Senior Grand Warden; and R. W. William R. Hammatt, District Deputy Grand Master, Provincetown 32nd District. Also present were Grand Lodge Officers R. W. David A. Davies, Grand Marshal; Wor. William H. Young; Wor. William R. Rogers, Jr.: R. W. George D. Rubin; Wor. Robert O. Rittenberg; Wor. Frank W. Pagano; Wor. Walter A. Vickers; Wor. John W. Hanson; Wor. Harold L. Smith; Wor. John H. Harris; and R. W. Rohert F. Faulkner. This page was last modified on 28 August 2018, at 13:56. This page has been accessed 38,767 times.